Alternate Energy Development Board is a Government of Pakistan controlled institution that is tasked with increasing the alternate energy contribution of the country to about 5% by 2030. According to the AEDB Act of 25th May 2010 following are the functions of the AEDB Board. (a) To develop national strategy, policies and plans for utilization of alternate and renewable energy resources to achieve the targets approved by the Federal Government in consultation with the Board. (b) To act as a forum for evaluating, monitoring and certification of alternate or renewable energy projects and products. (c) To act as a coordinating agency for commercial application of alternate or renewable energy. (i) Acting as a one window facility for establishing, promoting and facilitating alternate or renewable energy projects based on wind, solar, micro-hydel, fuel cells, tidal, ocean, biogas, biomass etc. (ii) Setting up alternate and renewable energy projects on it's own or through joint ventures or partnership with public or private entities in order to create awareness and motivation of the need to take such initiatives for the benefit of general public as well as by evaluating concept notes and technologies from technical and financial perspective. (iii) Conducting feasibility studies and surveys to identify opportunities for power generation and other applications through alternate and renewable energy resources. (iv) Undertaking technical, financial and economic evaluation of the alternate and renewable energy proposals as well as providing assistance in filing of required licensing applications and tariff petitions to NEPRA established under the Regulation of Generation Transmission and Distribution of Electric Power Act, 1997. (v) Interacting and coordinating with national and international agencies for promotion and development of alternate energy. (vi) Assisting the development and implementation of plans with concerned authorities and provincial governments and special areas for off grid electrification of rural areas. (vii) Making legislative proposals to enforce use and installation of equipment utilizing renewable energy. Posted in Indigenous Efforts. 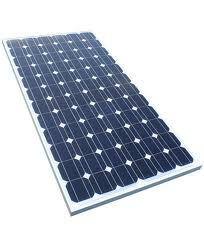 Tagged Alternate Energy, Energy Conservation, Indigenous Development, Solar Energy, Wind Power. After the devastating earthquake of 2005 which destroyed nearly half a million rural homes in Pakistan, there was an urgent need to build earthquake resistant homes. Thus came into being PAKSBAB which is the short form of Pakistan Straw Bale and Appropriate Buildings. 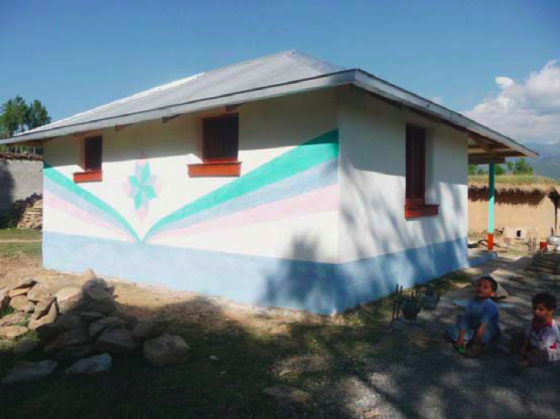 So far PAKSBAB, from its limited resources, has build 27 homes in northern parts of Pakistan. These homes have been built using indigenous resources and by training the local people in construction of straw bale houses. A typical straw bale house has an area of 576 square feet and costs $3000 on average. This turns out to be $5.2/square feet which is less than half the cost of brick and mortar houses. A typical home comprises of two rooms, a verandah and a kitchen and requires around 1200 hours of labour. 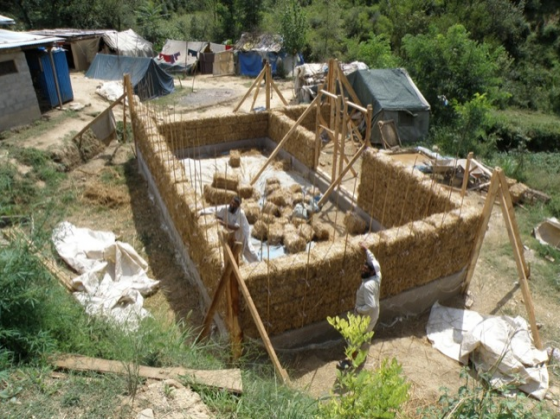 So 6 people working for 8 hours daily can construct a straw bale house in 25 days! The main advantages of straw bale houses over brick and mortar houses are highlighted below. 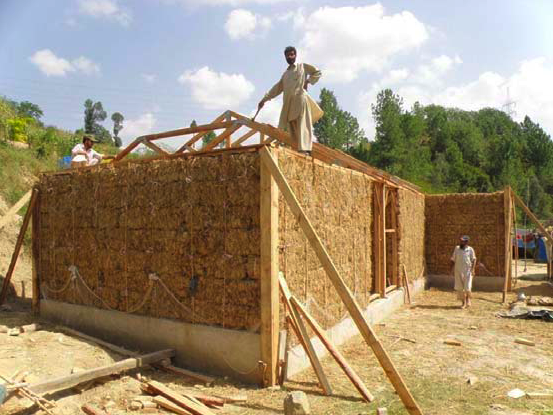 Straw bales required for the construction of these energy efficient and earthquake resilient homes are built using manually operated farm jacks and locally manufactured compression moulds. Furthermore the local industry is being encouraged to supply straw bales and other materials required for these projects. Additional appropriate building methods that PAKSBAB is promoting include passive solar, rainwater catchment, solar lamps, high-efficiency cooking and heating, and the use of natural building materials such as light straw clay, wattle and daub, and cob. Posted in Construction, Energy Efficiency. Tagged Efficiency, Energy, Indigenous Development, Temperature, Wind. Pakistan is blessed with solar and wind energy. 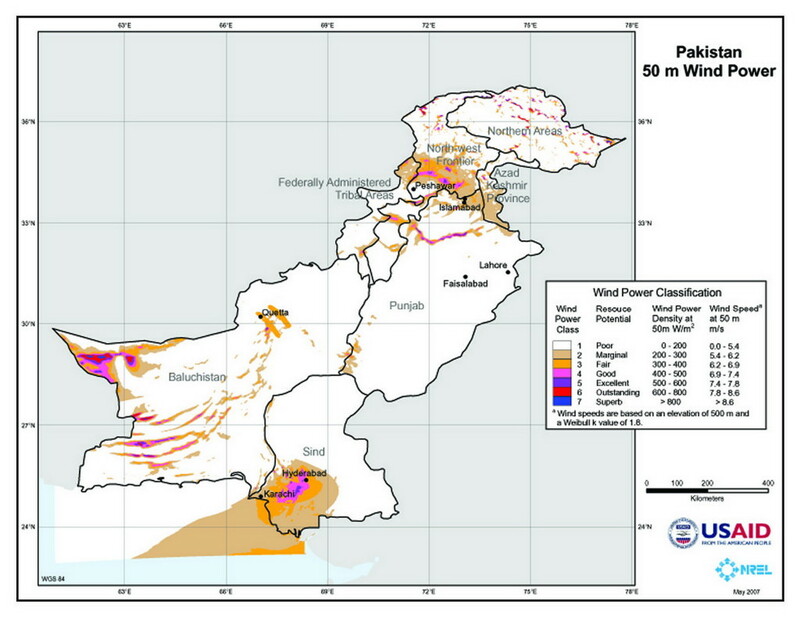 We have discussed solar in our previous articles, now let us have a look at wind map of Pakistan. It can be seen from the figure below that unlike solar which is available in most parts of the country wind power is available in only limited corridors along the coast and some northern parts of the country. It is well known that a wind speed of at least 12 miles per hour (5.4 meters per second) is required for the wind turbine to work. If we look at the major cities we can say that wind power is available in the cities of Karachi, Hyderabad, Quetta and Islamabad. Like solar, wind projects also require a large initial investment. Wind power projects can be divided into two main categories namely on-shore and off-shore. 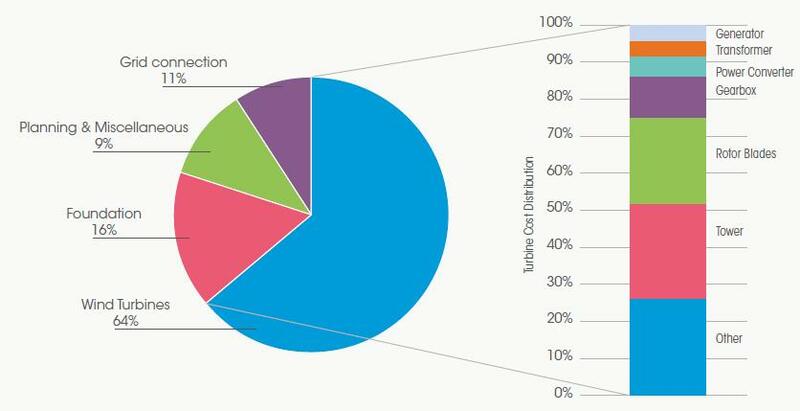 The typical cost for these projects in the developed world, is analyzed by IRENA in a study conducted in 2012. It can be deduced from this study that for on-shore projects the cost is $1.7-$2.45 per Watt. This can be compared to price of solar for Quaid-e-Azam Solar Park Bahawalpur which is around $1.31 per Watt. Off-shore projects require even higher initial investment, with price per Watt ranging from $3.3 to $5.0. If we look closely at the costs for an on-shore project we see that 64% of the cost goes into the construction of wind turbines. Within this category the major cost is associated with the rotor blades and tower. These two components of the wind turbine account for more than 30% of the total cost. Other major contributor to the total cost is the foundation which accounts for 16% of the total cost. For off-shore projects the rotor blades and tower contribute about 50% to the total cost. A description of the main components of the Wind Turbine is given below (reproduced from IRENE document). Tower: These are most commonly tapered, tubular steel towers. However, concrete towers, concrete bases with steel upper sections and lattice towers are also used. Tower heights tend to be very site-specific and depend on rotor diameter and the wind speed conditions of the site. Ladders, and frequently elevators in today’s larger turbines, inside the towers allow access for service personnel to the nacelle. As tower height increases, diameter at the base also increases. Blades: Modern turbines typically use three blades, although other configurations are possible. Turbine blades are typically manufactured from fibreglassreinforced polyester or epoxy resin. However, new materials, such as carbon fibre, are being introduced to provide the high strength-to-weight ratio needed for the ever larger wind turbine blades being developed. It is also possible to manufacture the blades from laminated wood, although this will restrict the size. Generator: The generator is housed in the nacelle and converts the mechanical energy from the rotor to electrical energy. Typically, generators operate at 690 volt (V) and provide three-phase alternating current (AC). Doubly-fed induction generators are standard, although permanent magnet and asynchronous generators are also used for direct-drive designs. Transformer: The transformer is often housed inside the tower of the turbine. The medium-voltage output from the generator is stepped up by the transformer to between 10 kV to 35 kV; depending on the requirements of the local grid. Bottomline: For Pakistani companies interested in indigenous development of small wind turbines (0.2kW - 100 kW) a good point to start is to develop rotor blades and towers which contribute to 30% cost of an on-shore wind power project (this increases to 50% for off-shore projects). The material used could be steel or wood which is easily available in the local market. One can also experiment with lighter materials that increase the efficiency of the system. A small wind power project of 3000 Watts can easily support all the appliances of a typical household in Pakistan (except the heavy loads such as air conditioners or large freezers/refrigerators). Posted in Wind Power. Tagged Alternate Energy, Indigenous Development, Pakistan Wind Map, Wind, Wind Power.